The 2017 NEC includes usability features to aid the user. Changes other than editorial are indicated with gray shading within sections. An entire figure caption with gray shading indicates a change to an existing figure. New sections, tables, and figures are indicated by a bold, italic in a gray box to the left of the new material. An N next to an Article title indicates that the entire Article is new. Where one or more complete paragraphs have been deleted, the deletion is indicated by a bullet (•) between the paragraphs that remain. 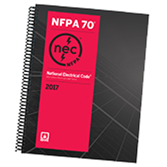 Get up to date on the latest regulations for electrical wiring, overcurrent protection, grounding, and equipment installation with the NFPA 70®, NEC® Spiralbound. What's it take to produce the NEC? Nineteen code-making panels, 4,012 public inputs, 1,512 public comments, and 126 gallons of coffee. Download our infographic that details the process. 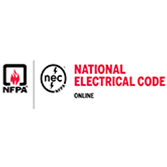 NFPA's Jeff Sargent, Regional Electrical Code Specialist, hosts a video series on changes to the 2017 NEC. 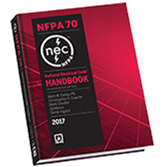 New NEC® Online lets you navigate the 2017, 2014, and 2011 editions of NFPA 70®: National Electrical Code with ease! 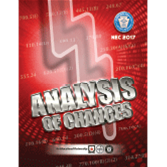 The new Analysis of Changes is a MUST-have that clarifies 255 revisions in the 2017 NEC®! 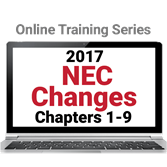 NEC® changes video series Jeff Sargent hosts a video series on changes to the 2017 NEC.